Filled with insights on branding and marketing, Passive Income Freedom sets forth practical advice on profitable enterprises online. 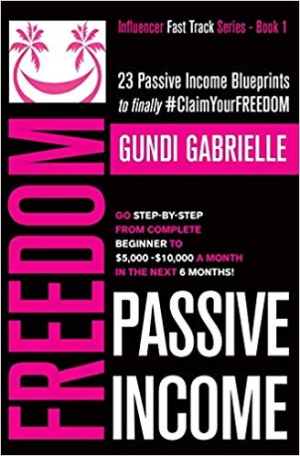 The internet provides many new avenues to making money, and Gundi Gabrielle’s Passive Income Freedom helpfully spells out novel methods for generating earnings. This Influencer Fast Track series title breaks down different forms of online entrepreneurship, including video, Instagram, apps, SEO, and content platforms. It is broad in scope, thorough in its research, and clearly explains what works best and why. An easy-to-understand, step-by-step guide for those perplexed over personal finances, the book lays out blueprints for earning “between $5,000 to $10,000 a month” from various internet ventures. It is filled with insights on branding and marketing and sets forth practical advice. However, its projected results sometimes sound too good to be true. The book’s guidance could prove useful to those coming in with realistic, tempered expectations. A primer to e-commerce and side hustles that’s stuffed with lingo like “the laptop lifestyle” and “#claimyourfreedom,” it covers creative and little-heralded approaches to income generation, such as creating top-ranked videos for local markets to rent out space to advertisers. Its deep level of practical details will benefit anyone interested in drumming up secondary sources of income, and it focuses on realistic and doable enterprises that involve little risk or start-up capital. With an infomercial flavor that grabs and holds attention, the text hustles and encourages readers to share it with their friends and leave reviews on Amazon. It chases trends, talking about “appreneurs” and “solo-preneurs” in a sometimes gratuitous way. Jargon is rampant, and some recommendations seem tendentious. Some of the book’s claims—such as that publishing a bestseller is a lot less difficult than you think, or that one can multiply book royalties tenfold by creating online classes—sound exaggerated. While the text extends a wealth of free resources, it also endorses particular service providers in a way that risks dating the work. The fluid and ever-changing nature of the internet perhaps means that this text should be read and acted upon quickly. The book is quick and readable, with breezy and brief paragraphs stacked end on end. It reads as more brisk than its actual length, and its digestible chunks make it easy to plow through. Friendly and practical, Passive Income Freedom may sometimes overstate its case, but is still a helpful guide to making money in many different ways online.